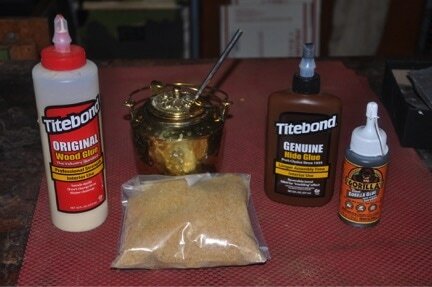 For over 40 years I have exclusively used Titebond Original glue for all the structural joints in my instrument. . I am very comfortable with almost all of the properties of Titebond. It seldom lets me down. The one property that has continued to plague me is it’s tendency to creep under tension on some joints. Creep is movement, however slight, in a glue joint. On most joints it does not matter, but when it occurs on the top or back center seam, it makes the joint visible, which is downright ugly on a new instrument. I have never had a seam separate, but I have had many top and back center joints that become visible in reflected light, within a month of being strung up. I just sort of learned to live with it until I was reading a recent book by Jose Romanillos. Right there on the page he brings up the same center joint creep problem with Titebond and says the solution is to use hot hide glue (HHG). Having spent some time studying guitar making with Jose in Spain, I have come to respect his views. He claimed Hot Hide Glue (HHG) dries hard, with no creep. So, I went off to learn more about HHG. There are volumes written about HHG on the web. Try the www.frets.com site for lots of good info. I have never ventured into HHG territory because, like a lot of builders, it just seemed like it would be a hassle to use. Many people also question its’ sheer strength and ability to live in our humid environment here in Hawaii. The more I read about HHG, the more interested I became. Besides the non creep factor, some builders claim that it’s rigidity also positively affects sound. I can’t attest to that at this point. So, the last few months I have been on a HHG adventure in my building. I don’t use it on all joints, which I’ll explain later, but it is great for bracing and plate joining. I decided to design a little subjective test with 4 common glues; Titebond Original, Hot Hide Glue (HHG), Titebond Genuine Hide Glue (called GHG here after), and Gorilla Glue (the polyurethane version). Not many builders use Gorilla Glue, but I know at least 2 who glue their bridges on with it. 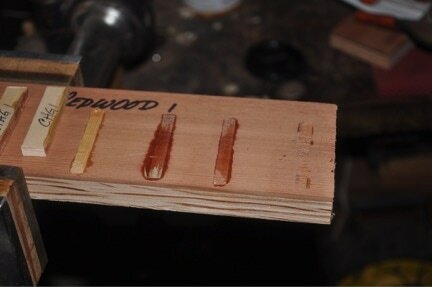 My intention with this test was to give me some insight into the strength of HHG as compared to other glues. That was the only property I was looking at. I admit that there is no science to the measurement in my test, but subjectivity is such a big part of what we do that I am comfortable with my experimental design. I simply glued the spruce pieces onto the redwood/ply laminate, and after a given period of time tried to break the spruce loose using what I subjectively tried to judge as equal pressure. I applied the pressure sideways with 2 thumbs. Clamping was done with spring clamps. I applied the Titebond, HHG, and CHG as you normally wood, and also used a water mist to activate the Gorilla Glue as per manufacturers recommendations. 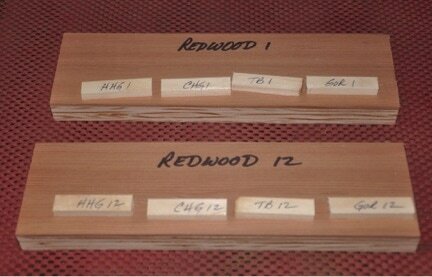 The 1st photo in this article shows 2 of the redwood test pieces, but I actually used 3. 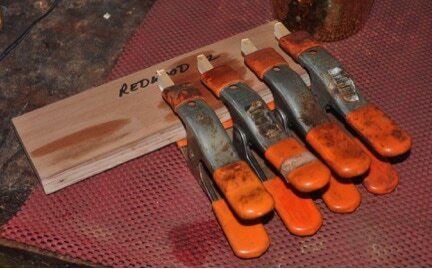 I clamped the spruce pieces for 1 hour, 2 hours, and 12 hours, before trying to break them off. The 1 hour result was that the Titebond Original and the HHG both broke either the spruce or the redwood before they would come off. Both the Gorilla Glue and the GHG came off easily. After 2 hours, the Titebond, HHG, and Gorilla Glue all caused the wood to break before the spruce pieces would come loose. After 24 hours all the glues seem to have achieved the same strength. All that I gained from this test, which is meaningful to me, is that I feel I can trust HHG as far as the strength factor goes. That gives me confidence in using it. The whole HHG prep ritual that I was afraid to enter into turned out to be about as difficult as making a cup of tea or coffee. It takes me 5 minutes each morning, and I’m good to go for the day. Much of this I learned from the previously mentioned www.frets.com website. HHG comes in granulated form. It is heated and mixed with water to make the glue luthiers use. As long as you keep it dry, it basically has no limit on shelf life, as far as I know. You do need some set up gear to keep the dissolved liquid glue at about 145 degrees. There are lots of suggestions on the web as to how to make an almost free set up for melting the glue granules and keeping the liquid up to temperature. I chose to just purchase an official one. It is simply a little low wattage hot plate, a pot that holds hot water, and another little pot that holds the glue and floats in the larger water bath. The set up is just a little double boiler with a temp control. Stew-Mac has an expensive one, Lee Valley has a much cheaper one, and the one I bought on Amazon is somewhere in between in price. To prep my glue for use in the morning, I remove yesterday’s cooled liquid from the fridge. It will have jelled and needs to be heated to form a liquid again. I keep it in the fridge in a microwaveable plastic container. I heat the right amount of water to fill the large water bath in the microwave for 3 minutes and pour it into the water bath container. Then I heat my cooled HHG in its’ plastic storage container for 20 seconds in the microwave again and pour it into the small pot that will float in the water bath. I take that out to the shop and set it on the little hotplate. If I need more glue for my projects, I add water and HHG granules into the hot glue mix. I have not found the need to soak the granules overnight as you often see in the literature. I could be wrong about that, but so far it works fine. HHG is easy to work with. People do all kinds of strange things with it, like unclamped joints, called rub joints. I clamp as I usually would with Titebond. HHG does require a very good surface prep. The wood surfaces need to mate very well. At this point I’m using it strictly for bracing and joining tops and backs. I’m not brave enough to use it for gluing on tops and backs or for attaching my dovetail neck joints yet. It is commonly said that Titebond does not fill gaps, but I think we all know that is not true. I have enough rock hard globs of glue on my shop floor and the side of my bench to know it can certainly build up to fill spaces. So, on some surfaces, where I am not 100% certain of a totally tight wood- to -wood fit, I will continue to use Titebond for now. There are a few other tricks to using HHG. It has a very short open clamp time. You need to work fast. Some builders slightly extend open time by using a heat gun or lamp to heat the surfaces to be glued. As far as clean up goes, it is easy. Far less squeeze out than Titebond, and it won’t continue to squeeze out for several minutes the way Titebond does. It dries relatively colorless, so that’s a plus too. Clean up can be done with a cloth and some warm water, or if you wait just a few minutes you can often lift the squeeze out off in a gummy little string of glue.